The 2017 Kawasaki Mule Pro Lineup features the fastest and most powerful MULE Side x Side ever built. With a wide variety of models available, the MULE PRO series is perfect for any ranch, job site, farm or fleet as well as time on trail. 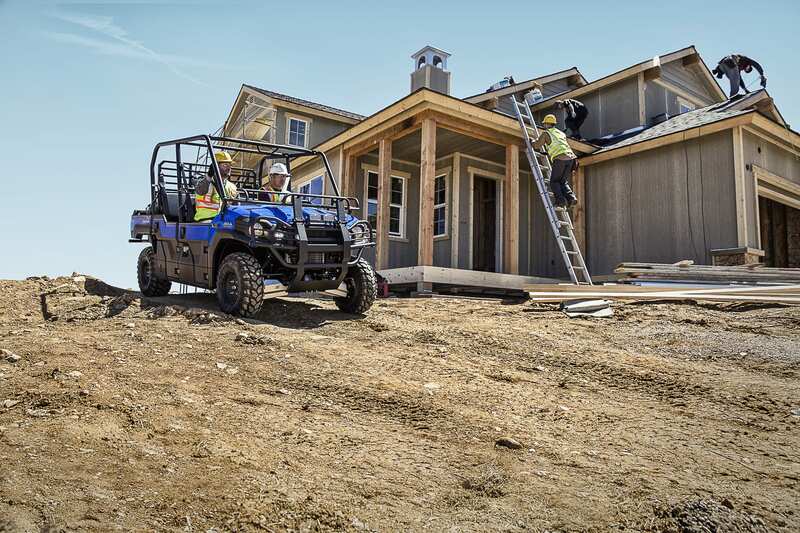 They provide Side x Side versatility with either a 812cc three-cylinder fuel injected DF®I gasoline engine that delivers a class-leading 48 lb-ft of torque, or a 993cc three-cylinder diesel engine that has relentless torque when you have to haul or tow all day long. 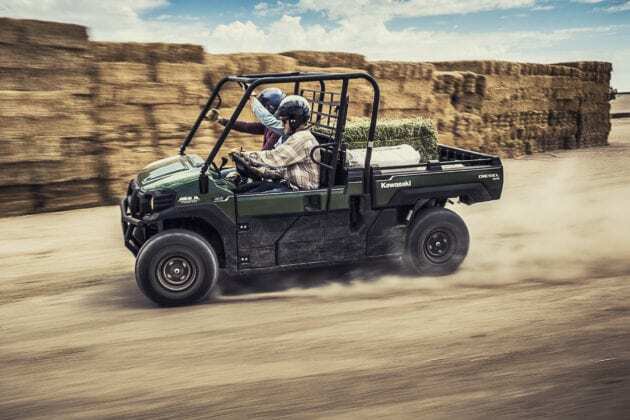 Power from the engine is passed through a precisely tuned Continuously Variable Transmission (CVT) with an electrically selectable 2WD/4WD system and dual-mode locking rear differential, giving the driver control in any condition. 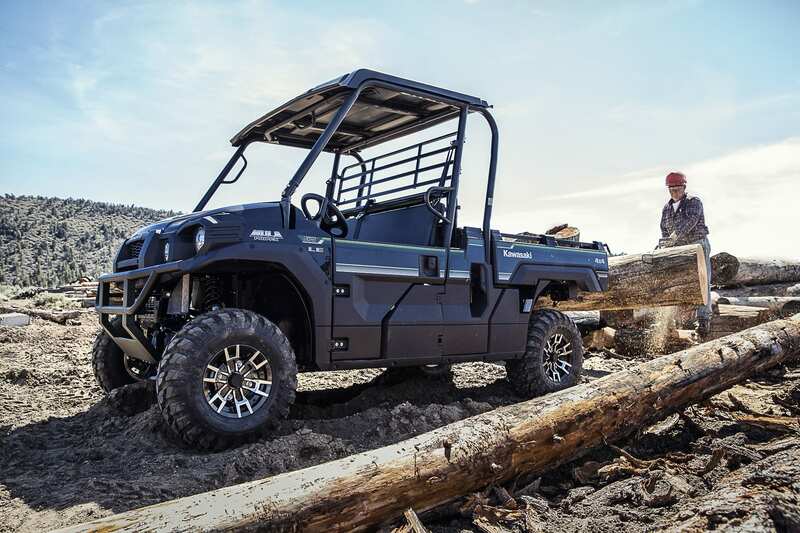 The Side x Side is built with a tough chassis that provides a smooth ride through the use of independent suspension front and rear. The suspension provides a generous 8.7” of travel and excellent ground clearance allowing the vehicle to traverse most terrain. 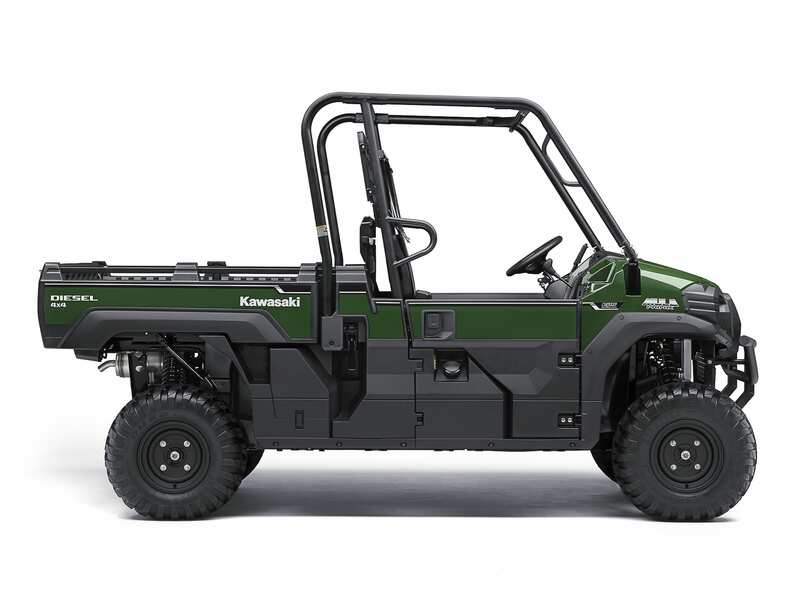 The MULE PRO series takes full advantage of Kawasaki’s speed-sensitive Electric Power Steering (EPS) system on all of its models. It reduces steering effort at low speeds, and provides optimal steering feedback to enhance handling as speed increases. 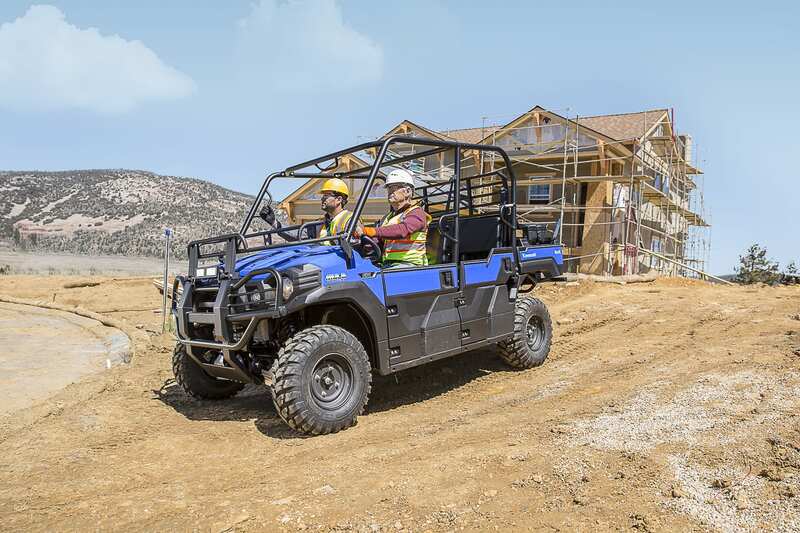 The EPS helps to reduce bump steer on rough terrain, reducing driver fatigue and helping the driver enjoy a tight 16ft turning radius. 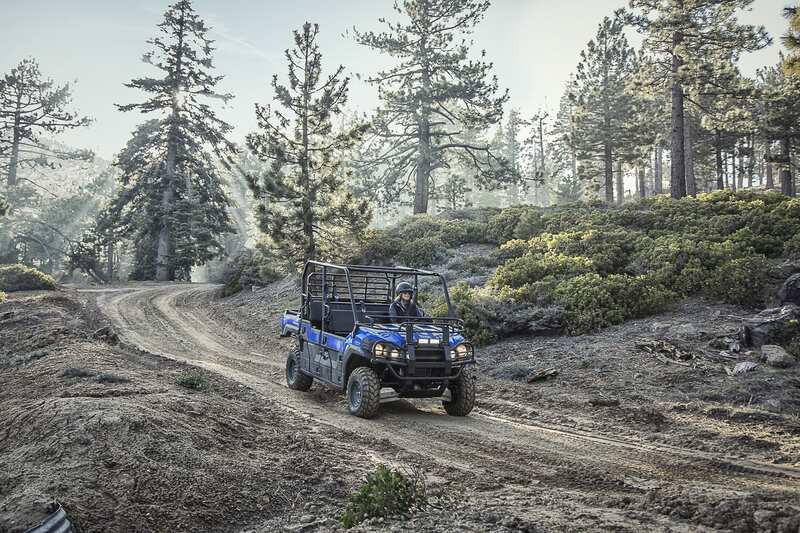 One of the main features of the MULE PRO series is its versatile Trans CabTM seating system, available on the MULE PRO-FXT and MULE PRO-DXT models. 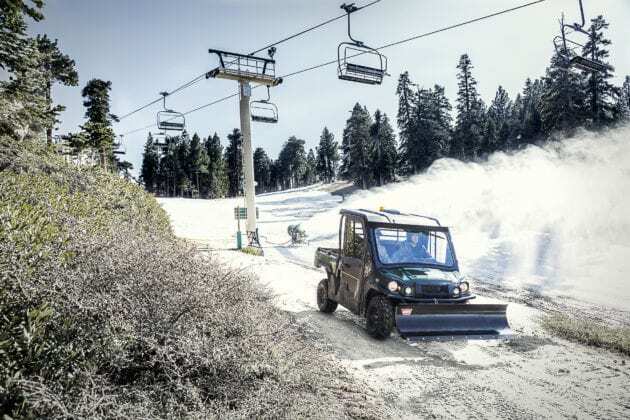 The Trans Cab system leads the industry with its 1:1:1 seating conversion system, allowing one person to convert the seating configuration from three to six passengers with one trip around the vehicle in about a minute. 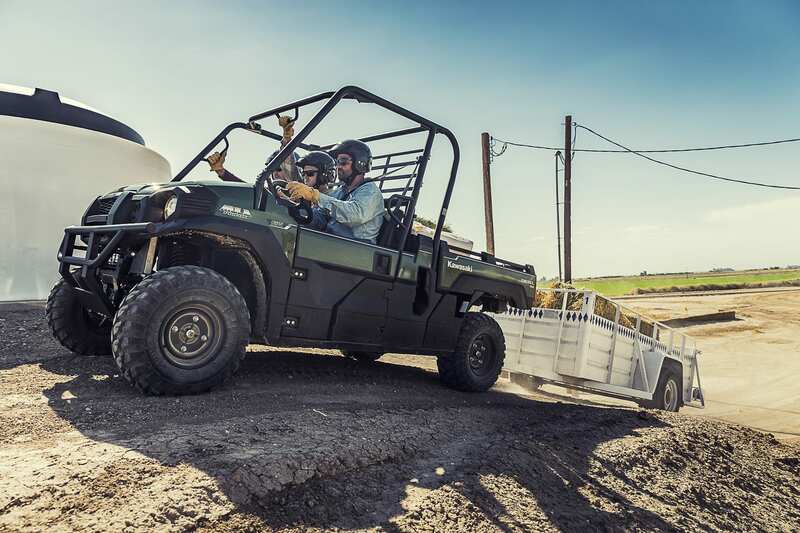 This means the MULE can expand its cargo capacity, carrying up to 1000 pounds in the three-passenger mode and upto 350 pounds in the six-passenger configuration. 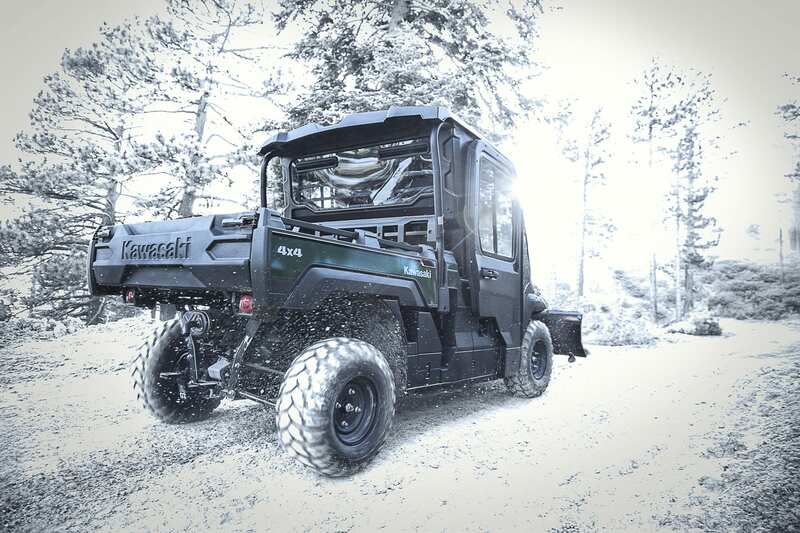 Both the MULE PRO FXTM and MULE PRO DXTM models feature the largest cargo bed in their class (54.1in x 53.3in. x11in) and are able to accommodate a standard size wooden pallet (48in.x40in.) giving the vehicle more versatility. Built Kawasaki Strong, all of the MULE PRO cargo beds have a diamond-plate, steel cargo bed floor as well as a gas-assisted tilt feature that allows the user the ability to clean the cargo bed floor and easier access to the engine compartment. 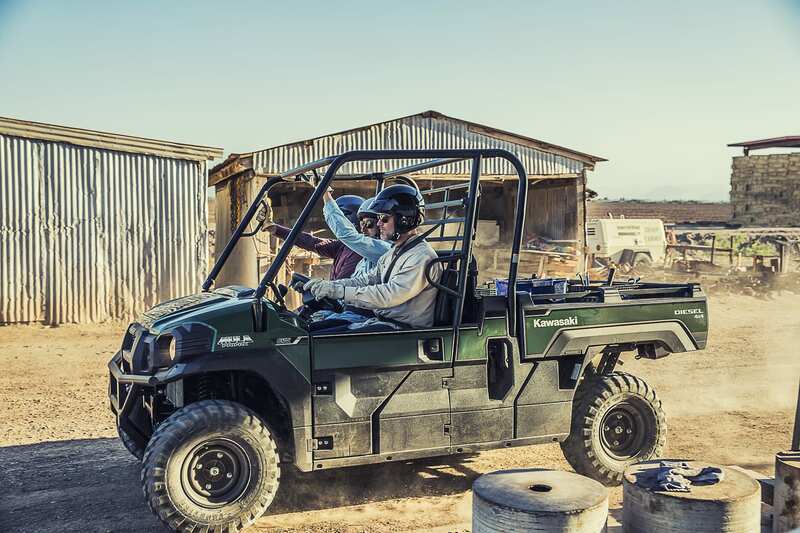 The tailgate is secured by two latches, making it easier to open and close. The cargo bed walls are designed with slots to accommodate cargo bed dividers and are topped by the KQRTM rail system with quick release capabilities to allow for quick and easy mounting of KQR accessories. The driver and all passengers will experience a comfortable premium feel with the MULE’s plush front and rear bench seats, that are easy to get on and off of with ample space and three-point seatbelts for all passengers in the cabin. A multi-function LCD instrument cluster provides a large, easy-to-read display including speedometer, odometer, hour meter, fuel gauge, dual trip meters, 2WD/4WD indicators, and clock and much more to keep the driver informed. The MULE PRO series of side x sides all have a ROPS (Roll Over Protection Structure) system as well as a 2” receiver hitch to tow up to 2,000 lb with the optional draw bar. These add to the versatility and functionality of the durable Kawasaki vehicle, which also comes with a standard Kawasaki STRONG three-year limited warranty. The MULE PRO series vehicles have integrated inner wheel wells to help keep mud and debris out of the engine compartment, protecting its components. 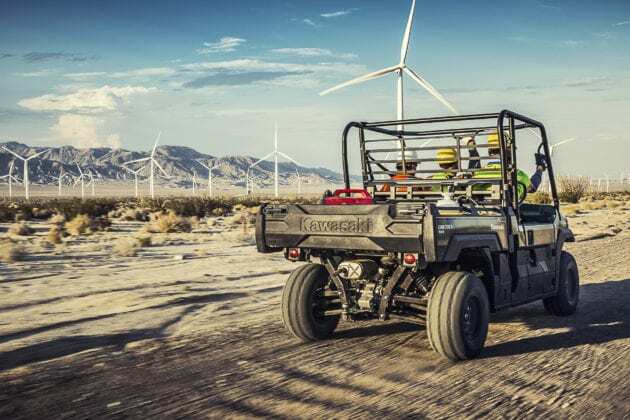 The electrical equipment is also mounted high in the vehicle to keep it away from water, and the fuel tank is centrally mounted away from the wheels to reduce the risk of damage from debris thrown up by the tires. 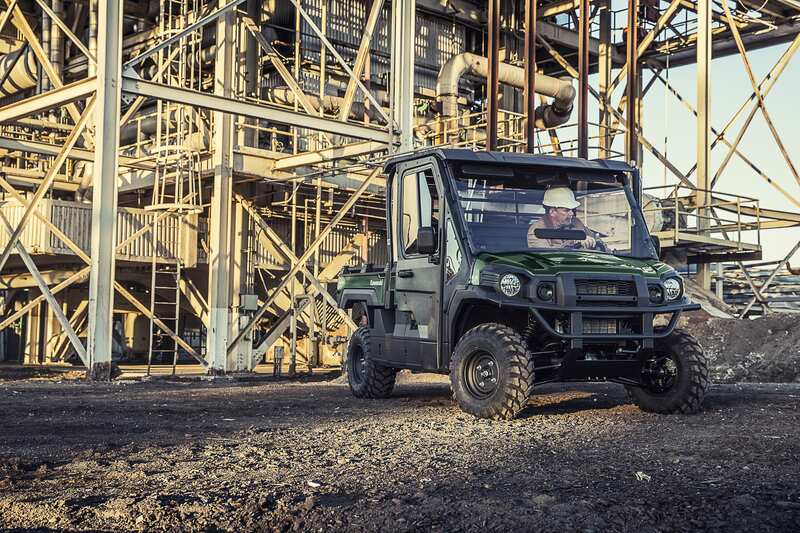 Additionally, steel side guards help reduce the effects of side impacts. 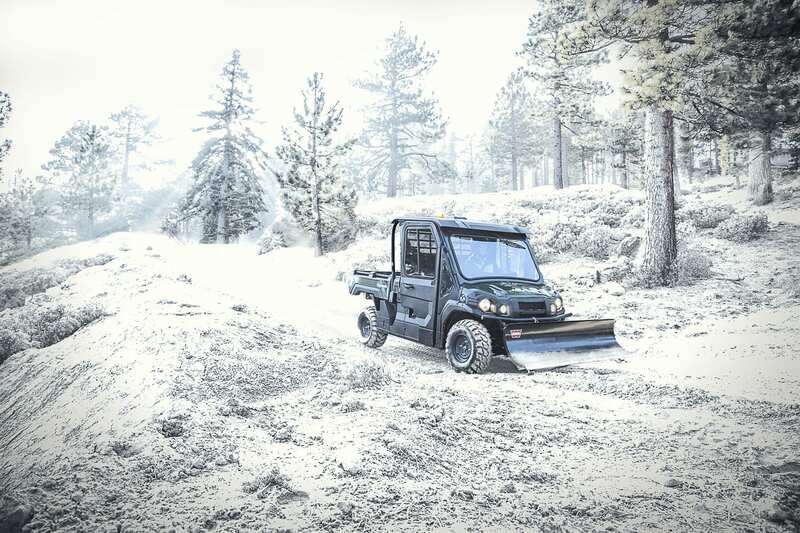 Various maintenance covers to provide quick and easy access to the key service areas on the vehicle. They allow the user to check the oil level, service the air cleaner, check fuses as well as access the battery and ECU connection. Potential buyers will be happy to see the steel front bumper and steel cargo bed. These crucial parts provide greater durability and strength, keeping the MULE PRO series Kawasaki STRONG. Customers can choose from more than 60 Kawasaki Genuine Accessories made specifically for the MULE PRO series including a hard cab enclosure, soft cab enclosure, windshield, winch, brush guard, rear view mirror, skid plates, cargo bed extender and sound system. Adding to the appeal of the MULE PRO series is Kawasaki’s commitment to keep you running STRONG with our standard Kawasaki STRONG Three-Year Limited Warranty. 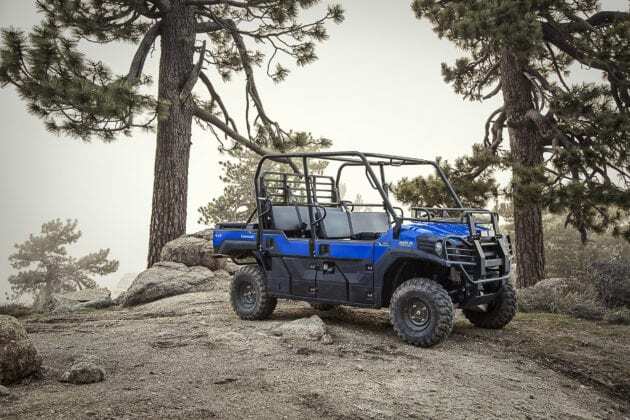 Both the MULE PRO gasoline and diesel model lineups offer multiple trim levels. 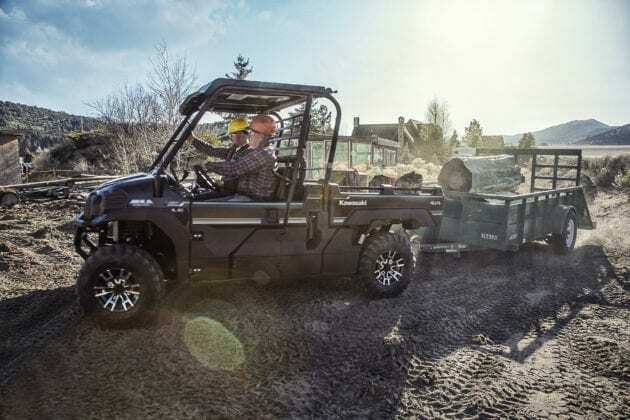 The standard MULE PRO-FXT and the MULE PRO-FX come standard with steel wheels, 26” Duro tires and a high-capacity 60.8 amp alternator that provides superior charging output via two DC outlets in the front cab. Both are available in Super Black. The MULE PRO-FXT EPS and MULE PRO-FX EPS come with everything on the standard models, and include Electric Power Steering and a tilt steering wheel that has up to 40 degrees of adjustment depending on the model. The next step up is the MULE PRO-FXT EPS LE and MULE PRO-FX EPS LE, which feature the same standard features of the EPS models with the addition of two auxiliary LED headlights for maximum visibility in low-light scenarios, stylish 12-inch six-spoke lightweight aluminum wheels, a composite sun top for occupant protection from the elements, dressed up graphics, as well as two additional DC charging outlets for rear-seat passengers (MULE PRO-FXT EPS LE). 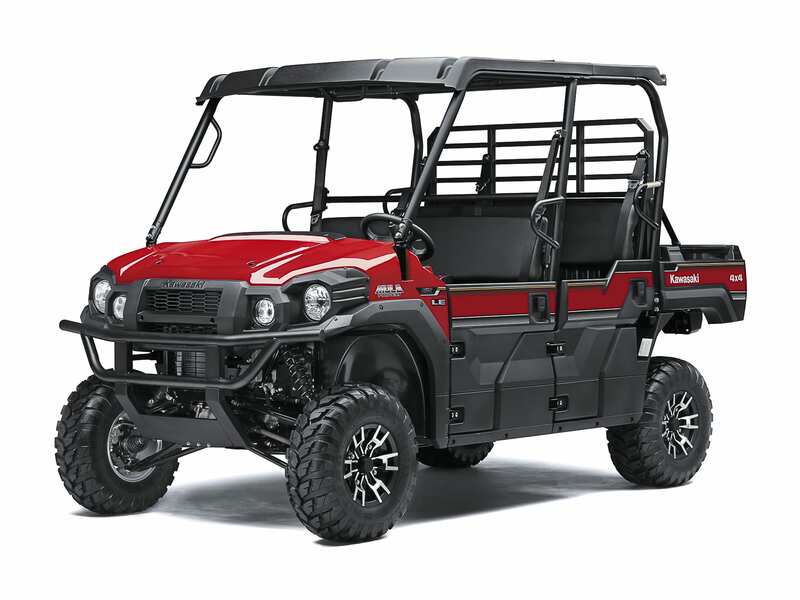 The EPS LE models are available in Super Black and Firecracker Red. For the consumer looking to blend into their surroundings, Kawasaki also offers the MULE PRO-FXT EPS CAMO and the MULE PRO-FX EPS CAMO models that come in Realtree Xtra® Green with scratch resistance and include EPS, tilt steering and two Auxiliary LED headlights. The MULE PRO-FXT also features an additional trim level: the MULE PRO-FXT Ranch Edition, which features all of the standard equipment from the MULE PRO-FXT EPS LE and adds two-tone padded embossed logo seats, a winch with remote control, special badging and Metallic Titanium painted bodywork. 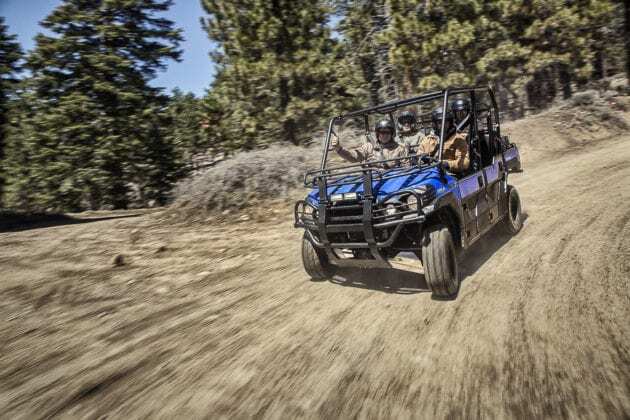 The MULE PRO-DXT and MULE PRO-DX are available in three trim levels. The MULE PRO-DXT and MULE PRO-DX come standard with steel wheels, a tilt steering wheel and two DC outlets in the cab and are available in Super Black. The MULE PRO-DXT EPS and MULE PRO-DX EPS add Electronic Power Steering and contrasting color graphics along the hood, doors and cargo bed in Timberline Green. The MULE PRO-DXT EPS LE and MULE PRO-DX ESP LE include all the aforementioned equipment and add auxiliary LED headlights and a composite sun top. The EPS LE models are available in Dark Royal Red. 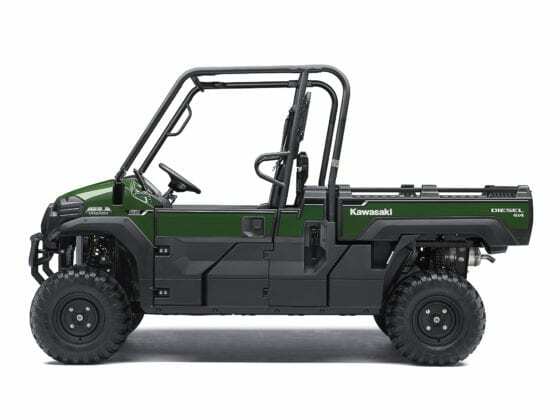 Kawasaki’s tagline, “Let the good times roll., Is recognized worldwide. The Kawasaki brand is synonymous with powerful, stylish and category-leading vehicles. 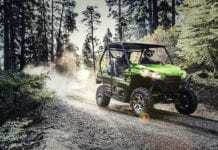 Information about Kawasaki’s complete line of powersports products can be found on at www.kawasaki.ca.